Starting in 2007, Gina Luker dabbled in blogging — but after some life changes, she decided to become more focused as a writer. 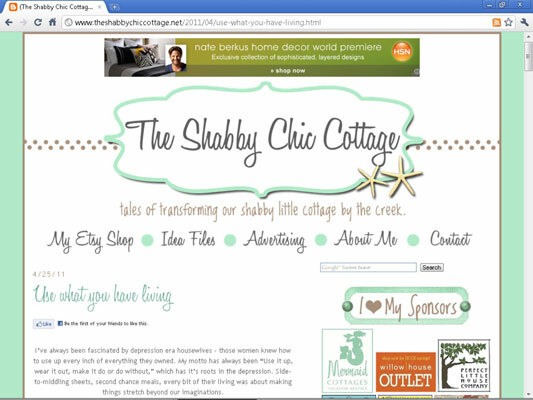 Taking a college professor’s advice — write about what you know — she started The Shabby Chic Cottage in early 2009. She started it as a digital scrapbook to keep up with the changes of remodeling her childhood home. Within a few months, she realized that not only was she attracting regular readers, they were commenting frequently. After only three months, she received an e-mail asking to purchase advertising on her blog. When her blog was six months old, at the prodding of her readers, Gina opened her self-named Etsy store. And within a year of starting her blog, she was earning enough from advertisers and her Etsy sales to quit her day job. Gina is doing everything right with her business. She’s passionate, created a thriving community, built a strong brand, provides excellent customer service, and isn’t afraid to go after the sale of her products. She is also one of the few Etsy sellers to utilize e-mail marketing to her past customers, which makes a big difference in her revenue. Notice how she has smartly diversified her income sources — not too many eggs in any one basket. Become involved. You don’t just move to a neighborhood and magically have a circle of friends — you have to get out and meet people. Blogging is like that. You create your space (your blog), and then share it with others. If you never leave your own site, you’ll be there all alone. Stay true to who you are. Each person has a unique perspective on life, so what she sees is fresh and new to her. Talk about your passions — whether it is parrots, hot sauce, even bad ’70s fashion. There is a blog, and an audience, for everything under the sun. Don’t let a blog take over your life. It can and will — if you let it. You’ll be up at 3:00 a.m. just leaving “one more comment.” You won’t have anything to write about if you don’t take time to live. Set a blogging timer (ten minutes, one hour, whatever you choose to devote), and stick to that. When your time is up, do whatever it is you are passionate about — then you’ll never run out of things to say. Started blogging: Personal blog established in 2007, her professional blog in April 2009. Income estimate: Gina doubled her previous full-time income as a journalist in her second year of blogging professionally. How Gina makes money: She sells advertising on her blog, sells her crafts in her Etsy store, has written an e-book, and also sells home decorating e-books written by others through affiliate marketing. She’s also started speaking at conferences to help others learn about what she has done.